You may remember the famous opening lines, 'Tyger tyger, burning bright'? and 'Shall I compare thee to a summer's day?' but would you be able to name the poems or the poets? The English language is jam-packed with wonderful verses that we've all heard at some point, but probably forgotten. 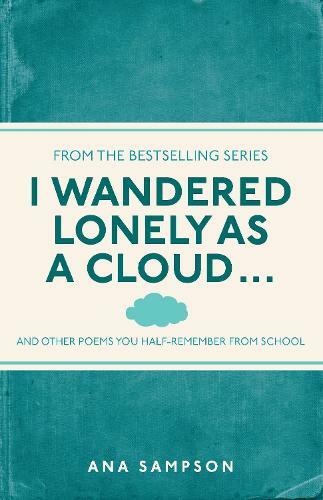 I Wandered Lonely As a Cloud helps us remember all those long-forgotten poems that we were taught at school, together with short biographies of the poets and introductions to the poems themselves. This title features such greats as Chaucer, Shakespeare, Wordsworth, Shelley, Coleridge, Kipling, Heaney and Yeats, the poems you may have once learned and others that have informed our everyday speech. Complete with a masterly index that allows readers to search not just by first lines, but by well-known phrases, I Wandered Lonely As A Cloud is a perfect addition to any poetry lover's collection.